Do you ever feel like you just can’t tame the chaos? Missing appointments, forgetting to make phone calls, and even realizing that you forgot to get groceries? Yep. Been there! If you are ready to maintain a more organized home, then you are in the right place. When you can get a handle on all-the-things, you will naturally feel better. 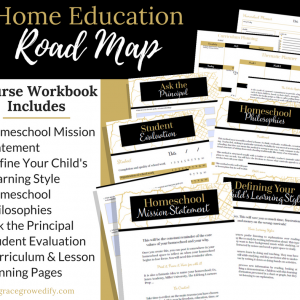 More productive, organized, and your family will reap the benefits! Notice I said “get a handle on” not to be confused with utter perfection. But studies show that we feel better about ourselves and our lives when we are organized. It’s true. 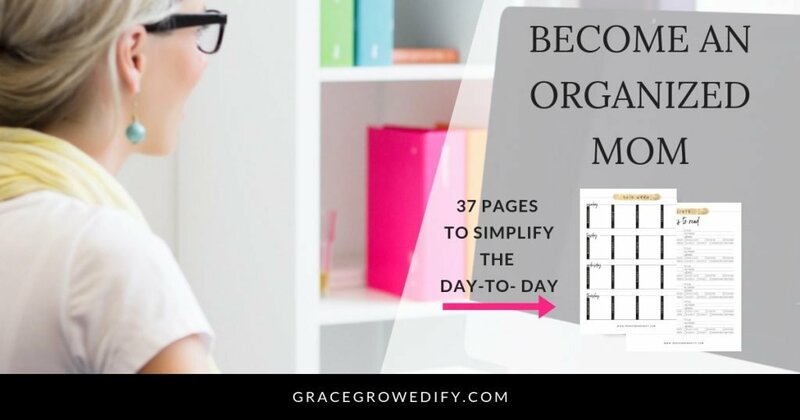 When we feel like the to-do list is never-ending, we can feel overwhelmed and depressed. Our mental health is affected by productivity, organization, and stress levels. Better organization means lower stress levels, which can also mean better relationships with our family and increased happiness. Who doesn’t need more happiness and better relationships? 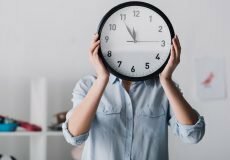 A few simple tweaks to how you manage your day-to-day tasks can improve your overall health. 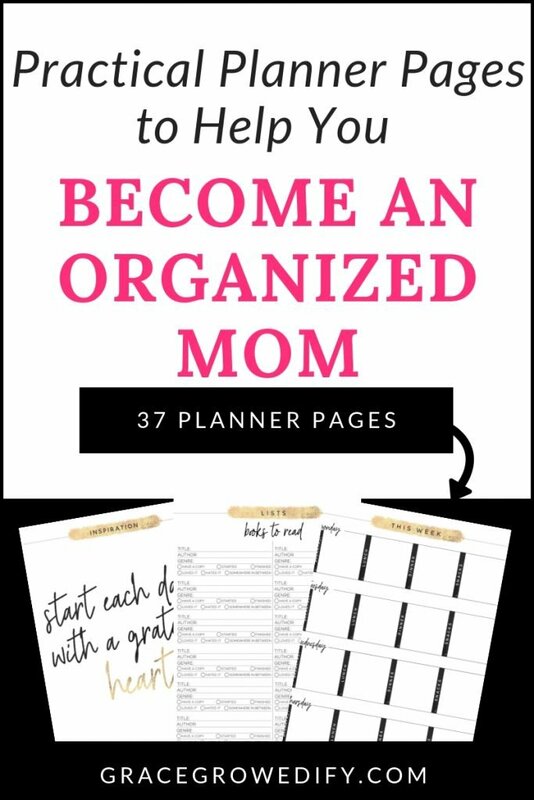 So I have compiled these planner pages to help you become a more organized mom! 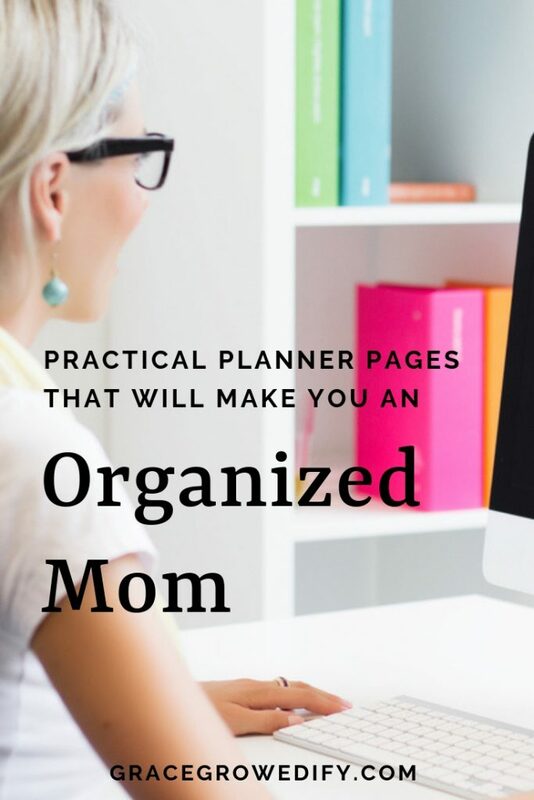 Remember, not a perfect mom but a more organized mom. All Un-dated Pages- You can reuse these forever! 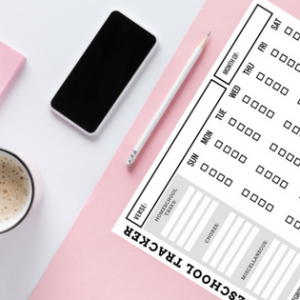 Personal Info Page – In case you would like to create a binder or mom planner to keep all of your planning resources in one place. This Week Daily Layout – A planner page for the week to capture all your “to-dos” in one spot. This Week Task Layout – One page to organize weekly goals, priorities, tasks, appointments and a spot for notes. 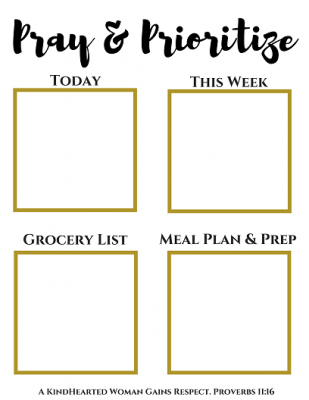 This Week Meal Planner – Two pages to plan breakfast, lunch, dinner, and snacks for every day of the week. Includes a shopping list on the second page for ease of use. 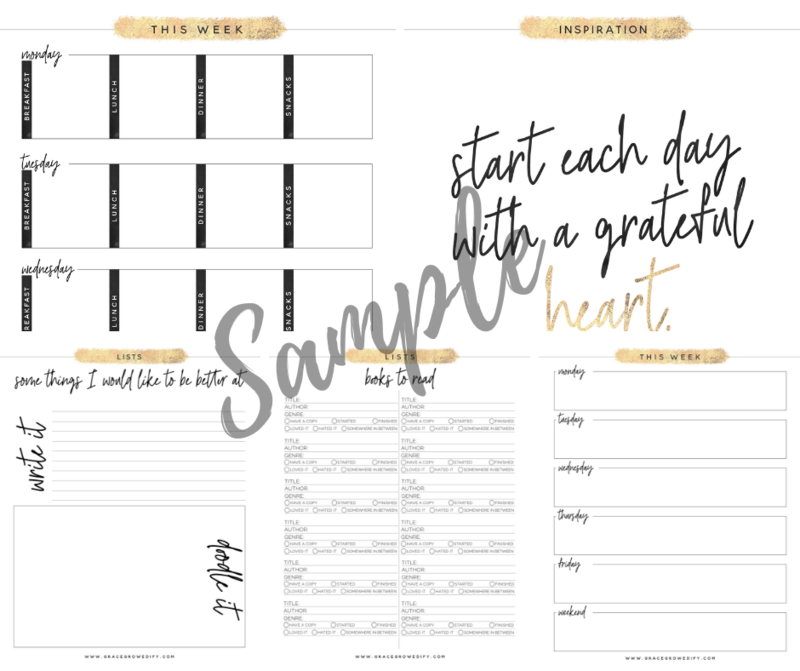 This Week Journal Page – Take a moment at the end of the week to record your favorite moments and what you are grateful for. The journal page is fantastic to promote personal growth and keeping records of special moments to reflect back on. Today – The perfect hit list for making sure the day runs well! 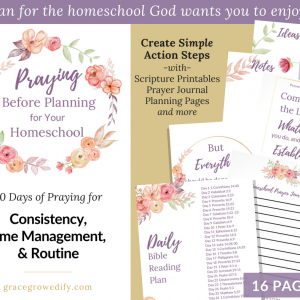 This page includes a space for the date and boxes to organize AM/PM happenings, daily priorities, tasks, and meal planning. Activity Schedule – Keep a running list of family or homeschool activities. No more forgetting your plans! 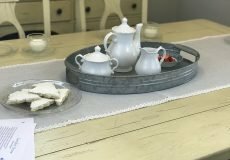 Morning Routine – Would you like to make a list of things to cover every morning? Make sure you start the day off right. 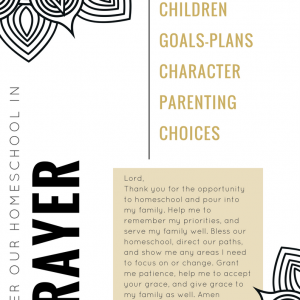 This works for morning routines or morning time checklists for your homeschool. Things To Get Done – A running to-do list for anything! 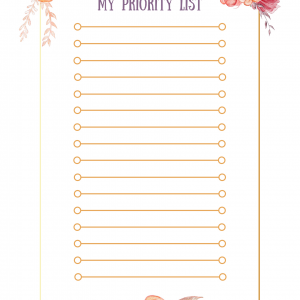 List Page – Print this handy list page off anytime you feel like making a list. Grocery List – This grocery list will save you time with boxes already sectioned off for pantry, produce, bread/bakery, meat & fish, deli & dairy, frozen foods, beverages, and other. Books To Read – Book lovers you are welcome! Yes, a specific book list to keep a log of books you want to read and an area to record your thoughts on them afterward. Movies To See – Same format as the above books to read. Things To Try – Yes just like the previous 2 pages. But such a cool idea, this page can work for any products! Things That Make Me Smile – Promote positivity! This list is great for boosting your mood and writing down or doodling about anything that makes you smile. Some Cool Ideas I Have – Write down and doodle your ideas. 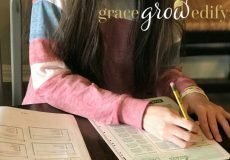 Some Things I Would Like To Be Better At – Sometimes we need to evaluate ourselves for growth to happen, right? This page will help you sort through anything you may need to improve upon. Some Things I Am Really Good At – As you evaluate, make sure to give yourself credit where it is due, and it never hurts to speak positively to yourself! 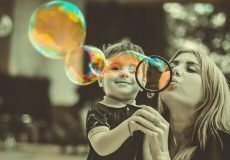 A Few Reasons Why I Am Awesome – Yes, the same idea as above. Boost your mood and focus on the positive. Inspiration Page – This blank page is ready for you to write, draw, or create your own perfect inspirational pages. Habit Tracker Page – Whether you are exercising, drinking more water or consistently doing anything, you can use this page to cultivate new habits.